The Traveling 219 Project continues its Maryland series, at a place where US route 219 becomes part of a major interstate i-68, in the northern part of Garrett County. This also happens to be where rt. 219 crosses rt. 40 the historic National Road, the first federally funded road in the country, built back in the early 1800s. Here, right outside Grantsville, Maryland, is the famous Penn Alps Restaurant, and next to it is the Spruce Forest Artisan Village, where Dan Schultz got to talk to some of the artisans. 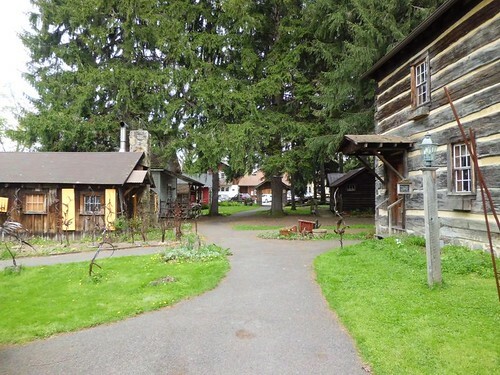 The Spruce Forest Artisan Village is a unique place, where craftspeople and artists work in transplanted original log cabins that are hundreds of years old. The Village is a non profit organization aimed at preserving and promoting crafts and traditions that have been part of the local mountain heritage for generations. Visitors are encouraged to stop in the artist studios inside the cabins, where the artists work and display and sell their art. Classes and artist workshops are also available throughout the summer. More information and directions to the Village can be found at: http://www.spruceforest.org/index.htm.